Own Paw Patrol - All Paws On Deck Mug from Deff, DVD, Blu-Ray & 4K Video Specialists - Free UK Delivery..
Own Paw Patrol - Everest Mug from Deff, DVD, Blu-Ray & 4K Video Specialists - Free UK Delivery..
Own Paw Patrol - Girl Pups Unite Mug from Deff, DVD, Blu-Ray & 4K Video Specialists - Free UK Delivery..
Own Paw Patrol - Group Mug from Deff, DVD, Blu-Ray & 4K Video Specialists - Free UK Delivery..
Own Paw Patrol - Is On A Roll Mug from Deff, DVD, Blu-Ray & 4K Video Specialists - Free UK Delivery..
Own Paw Patrol - Pups Save Christmas DVD from Deff, DVD, Blu-Ray & 4K Video Specialists - Free UK Delivery..
Own Paw Patrol - Skye Fly Mug from Deff, DVD, Blu-Ray & 4K Video Specialists - Free UK Delivery..
Own Paw Patrol - Skye Mug from Deff, DVD, Blu-Ray & 4K Video Specialists - Free UK Delivery..
Own Paw Patrol - Tracker Mug from Deff, DVD, Blu-Ray & 4K Video Specialists - Free UK Delivery..
Own Paw Patrol - Trio Mug from Deff, DVD, Blu-Ray & 4K Video Specialists - Free UK Delivery..
Own Paw Patrol Easter Egg Hunt DVD from Deff, DVD, Blu-Ray & 4K Video Specialists - Free UK Delivery..
Own Paw Patrol - Air Pups DVD from Deff, DVD, Blu-Ray & 4K Video Specialists - Free UK Delivery..
Own Paw Patrol - All Wings on Deck DVD from Deff, DVD, Blu-Ray & 4K Video Specialists - Free UK Delivery..
Save the day with 6 huge and heroic rescues with the PAW Patrol! EmBARK on two daring double-length adventures as the PAW Patrol transforms into magical Mer-Pups to save underwater friends AND rescues Adventure Bay from a dinosaur invasion! Plus, join the pups as they save Jake, the Adventure Day Parade, a kitty, and even Marshall! INCLUDES THESE EPISODES Pups Save Jake • Pups Save the Parade Pups Save a Mer-Pup Pups Save a Friend ..
Own Paw Patrol - Call Mug from Deff, DVD, Blu-Ray & 4K Video Specialists - Free UK Delivery..
Own Paw Patrol - Chase Mug from Deff, DVD, Blu-Ray & 4K Video Specialists - Free UK Delivery..
Own Paw Patrol - Easter Egg Hunt DVD from Deff, DVD, Blu-Ray & 4K Video Specialists - Free UK Delivery..
Own Paw Patrol - Game On DVD from Deff, DVD, Blu-Ray & 4K Video Specialists - Free UK Delivery..
Own Paw Patrol - Halloween DVD from Deff, DVD, Blu-Ray & 4K Video Specialists - Free UK Delivery..
Own Paw Patrol - Jungle Rescues DVD from Deff, DVD, Blu-Ray & 4K Video Specialists - Free UK Delivery..
Own Paw Patrol - Marshall & Chase On The Case! DVD from Deff, DVD, Blu-Ray & 4K Video Specialists - Free UK Delivery..
Own Paw Patrol - Marshall Mug from Deff, DVD, Blu-Ray & 4K Video Specialists - Free UK Delivery..
Collection of seven episodes from the children's animated series following the PAW Patrol, a group of hero pups who go around solving the problems that the people of Adventure Bay face on a daily basis. In these episodes the pups must save a helpless deer when Adventure Bay freezes over and when Jake (voice of Scott McCord) becomes stranded, new arrival Everest (Berkley Silverman) stages a daring rescue. The episodes are: 'The New Pup',..
Collection of episodes from the children's animated series following the PAW Patrol, a group of hero pups who go around solving the problems that the people of Adventure Bay face on a daily basis. In these episodes the pups must stop a ghost pirate ship from leaving the bay and stumble upon a hidden pirate cave where they begin hunting for treasure!.. 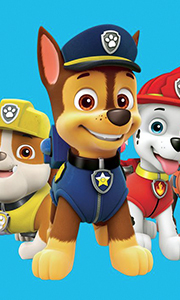 Collection of episodes from the children's animated series following the PAW Patrol, a group of hero pups who go around solving the problems that the people of Adventure Bay face on a daily basis. The episodes are: 'Pups Save the Sea Turtles', 'Pups and the Very Big Baby', 'Pups and the Kitty-tastrophe', 'Pups Save a Train', 'Pup Pup Boogie', 'Pups in a Fog', 'Pup Pup Goose', 'Pup Pup and Away', 'Pups Save the Circus', 'Pup a Doodle Do'..
Own Paw Patrol - Rubble Mug from Deff, DVD, Blu-Ray & 4K Video Specialists - Free UK Delivery..
Own Paw Patrol - Ruff-Ruff Rescue Mug from Deff, DVD, Blu-Ray & 4K Video Specialists - Free UK Delivery.. Dive in and join the sea patrol for 6 nautical adventures, including 2 double-length tails! The pups go into lifeguard mode to reunite a baby octopus with its mother, save an art show from hungry sea creatures, track hidden pirate treasure and more! Includes these episodes: Pups Save a Baby Octopus, Pups Save a Shark, Pups Save the Pier, Pirate Pups to the Rescue, Pups Save a Frozen Flounder, Pups Save a Narwhal..
Own Paw Patrol - The Great Snow Rescue DVD from Deff, DVD, Blu-Ray & 4K Video Specialists - Free UK Delivery..
Own Paw Patrol - Winter Rescues DVD from Deff, DVD, Blu-Ray & 4K Video Specialists - Free UK Delivery..
Own Paw Patrol Collection DVD from Deff, DVD, Blu-Ray & 4K Video Specialists - Free UK Delivery.. Whether they’re rescuing baby sea turtles or a beached whale, no job is too big and no pup is too small! Join the PAW Patrol for ten exciting adventures on their first-ever DVD as they save a train from a rockslide, a boat from the fog, a runaway elephant and a flyaway Mayor, plus a missing gosling and a missing chicken too! Includes These Episodes: Pups Save the Sea Turtles Pups and the Very Big Baby Pups and the Kitty-tastrophe Pups ..